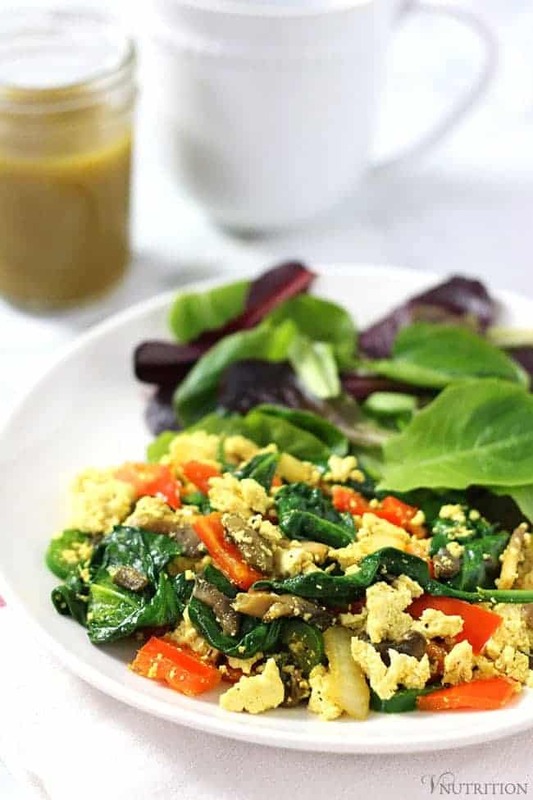 Have yourself a quick and healthy breakfast with this simple tofu scramble which can be ready in about 10 minutes! A perfect Saturday morning for me starts with an early morning run, then a long walk with my pups, and then (hopefully Matt) cooking us a delicious tofu scramble. One of the reasons I love a tofu scramble for breakfast is it can be so easy to make. You can have one ready in about 10 minutes. I remember doing a little cooking lesson with my cousin who was interested in adding a few meatless meals to her week. I showed her how to make my Buffalo Quinoa Balls and then we moved onto a tofu scramble. She couldn’t believe how quick the whole tofu scramble process was. When I was done she said, “that’s it?” and I replied, “yes, that’s how easy a vegan breakfast can be!” – needless to say, she was impressed. Tofu scrambles can be very versatile. The recipe below includes some the basics I use often but you can use any veggies that you have on hand. All you need a is a block of firm tofu, veggies, and a few spices. 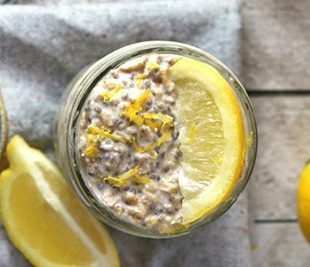 Because they’re so easy to make, sometimes I’ll do a double batch and have extra for a tasty and healthy breakfast to bring to work. Tofu is protein packed and contains a high dose of calcium and iron – just be sure to use a non-GMO and organic type. Depending on the veggies you use you’ll get different vitamins and phytochemicals. Heat 1 TB of oil in a large skillet. Add the onions, mushrooms, and pepper until cooked (about 5-8 mins). Crumple the tofu into pan, add spices, and a little water/veggie broth when necessary so nothing sticks to the bottom. Cook until heated through (about 3-5 mins). Once tofu is heated, add spinach and heat through. Nutrition based on the vegetables I used so it will change if you use other veggies. 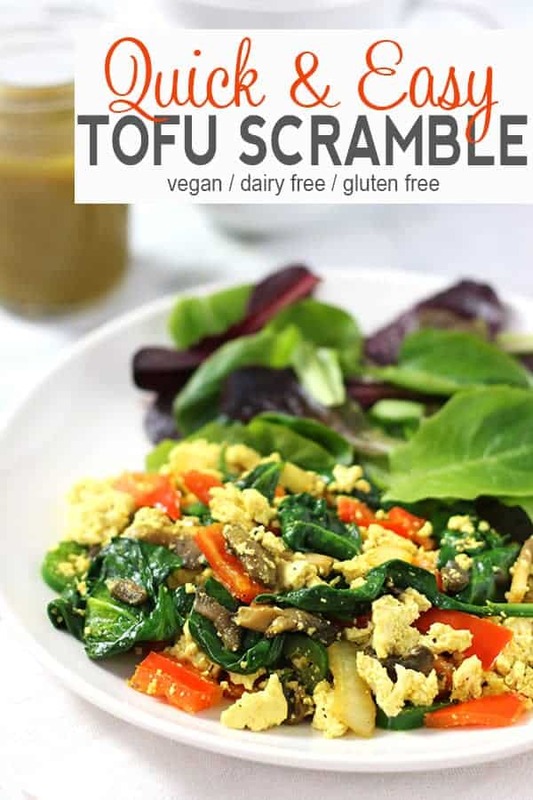 Like my Simple Tofu Scramble recipe? It would be so wonderful if you could give it some love by sharing! You know… I’ve never made a tofu scramble…!! Time to change that. Love your version! 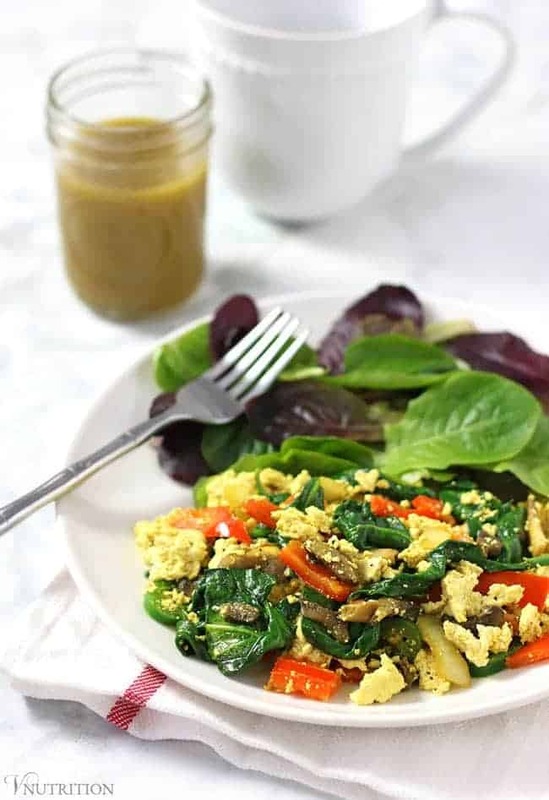 I love tofu scrambles, and your recipe looks awesome! I’ll have to make it for brunch this weekend. Thanks so much Becky! I hope you like it! I tend to get really elaborate with my tofu scrambles, so I like that you’ve made a nice, simple version! Yes, love me some mushrooms! 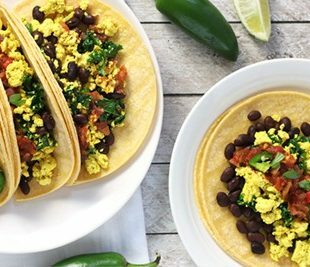 Is your tofu scramble on your blog? I’ll go check it out! It’s the best to come home from a run and have a scramble waiting for you! This looks great, thanks for reminding me it’s been too long since I’ve made a tofu scramble! Dude I am so jealous of your mornings LOL. But I love how you were able to pass on the tofu scramble to your cousin. We used to make tofu scrambles all the time, but I’ve taken a long break from tofu because it kinda messes with my system. The kids have been wanting me to make this again tho so I’ll have to add in the veggies you mentioned! Thanks Randi but that’s only when things come together perfectly. It’s usually a mess lol. I’m sorry tofu messes with you – that stinks. 🙁 If you do try it though or make it for the kids, let me know what you think! LOVE tofu scramble. I always put mushrooms in mine too. Love that you added turmeric. I’m obsessed with the stuff lately…and it gives such a beautiful golden color! Yum! Yes, turmeric is in like everything i’m making lately – so good! Tofu scramble is the best! And yours had my favorite ingredients (mushrooms and spinach). You have such great taste! It took me a while to get into tofu scrambles but they are a great meal option. This one has reminded me to bring scrambles back into rotation! Yes, I forgot about them for a little while and just brought them back lately! Leave out the salt and use Tamari instead. gives a nice crustiness to the tofu. Thanks for the suggestion Susan, I’ll have to try that on my next scramble! It’s so simple! It is actually one of the meals I plan on having my husband to make post baby. He never grew up cooking, so baby steps. I will try this “dressed up” tofu scramble. It looks beautiful. I have made a tofu scramble before and used it as I would do an Egg Salad sandwich, I did enjoy it. Thank you so much Claudette! The tofu scramble egg salad sandwich sounds like a tasty idea! 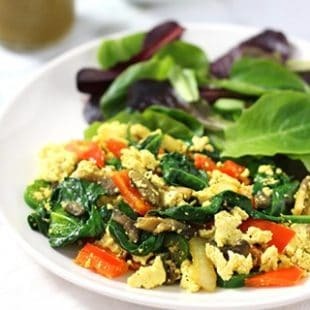 Love your version of tofu scramble, The mushrooms and spinach are great addition to this meal! Thank you so much Agness! I really appreciate it! My favorite! <3 A delicious breakfast..
What a perfect breakfast idea this is, Mary! One hell of a way to start the day off! This was delicious ! The only thing I did different was add some minced garlic. I’m glad you liked it! Oooh, I bet some minced garlic in there would be wonderful, I’ll try that next time too! 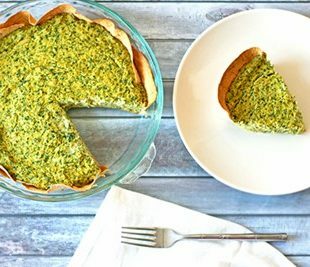 I always searching recipes of healthy breakfast and found your post, thanks for sharing recipe and nutrition facts Mary Ellen. 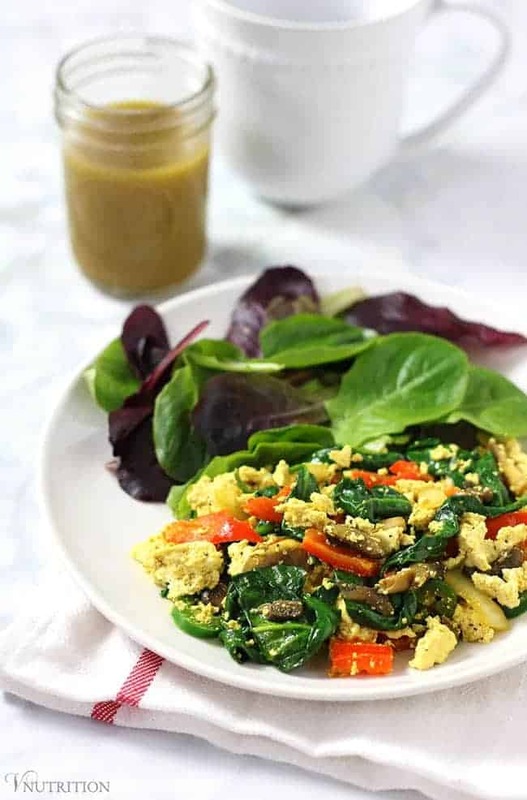 Simple tofu scramble contain only healthy ingredients and it’s fine for me. I think your nutritional information is incorrect. There’s no way that this is 167 calories/serving if this is only two servings. The block of tofu alone has 500 calories in it, plus a Tbsp olive oil (120 calories), and my veggies and spices came out to a total of 206 calories). Total is 825 calories, 413 calories/serving. Thank you so much for pointing this out! This happened with a few other recipes when I moved over to my new recipe plugin. I’ve updated based on cronometer calculations. The extra firm tofu in cronometer as well as on the organic Nasyoa tofu (which is the brand I use) is about 375-400 calories for a block of tofu. Other tofu brands might be different. 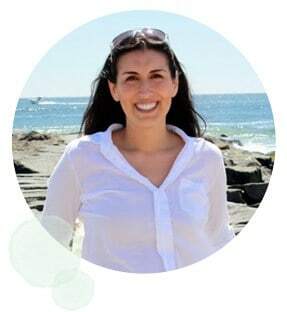 That’s why I say the nutrition info on my site is just general info and everyone should do their own calculations.